After the final whistles blew in FC Barcelona and Real Madrid’s games on Sunday night, both played at the same time, the only thing we know for certain is that the championship title will not be decided until the very last weekend. While watching their team cruise to a 4-1 win at Las Palmas, Barça fans around the world were also anxiously checking their mobiles to find out what was going on at the Santiago Bernabéu, where Madrid were facing a tricky home fixture against Sevilla. Sadly, the news was not good. Madrid took a bizarre lead after just ten minutes when Nacho Fernandez poked a free kick into an empty net while the visiting players were busy protesting the referee’s original decision, and 13 minutes after that Cristiano Ronaldo had made it two. The scoring pattern replicated events at the Estadio de Las Palmas, with Stevan Jovetić nabbing one back for the Andalusians before Cristiano added his second and Toni Kroos finished off the job. Their respective 4-1 wins mean that the two sides remain locked at the top of the table, now with 87 points each. But although Barça have the edge due to their superior head-to-head record, Real Madrid have an all-important game in hand, away to Celta on Wednesday at 9.00pm CET. Celta, eliminated from the Europa League by Manchester United midweek, were beaten 3-1 by Barça’s Copa del Rey Final opponents Alavés this weekend. Whatever Madrid achieve in Vigo, it won’t be enough to mathematically secure them the trophy. That won’t be decided until Sunday night, when the two sides will once again be playing simultaneously from 8.00pm CET. 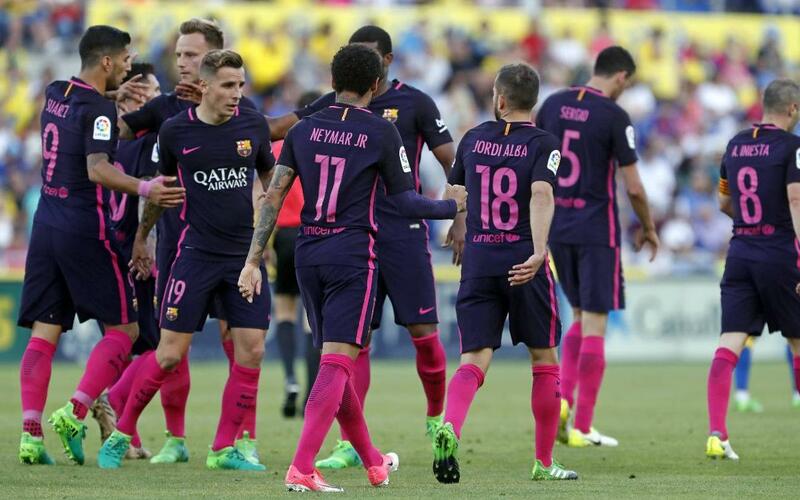 Barça are at home to Eibar (TICKETS HERE) and Real Madrid visit Málaga. The all-whites need four points from their last two games to win LaLiga. So all Barça can do now is make sure they win their own game and keep their fingers crossed that their rivals lose one of theirs. Celta and Málaga are going to be every Barça fan's second and third favourite teams for a few days!